A Scottish ski holiday is straight-forward to organise – all the major are within easy reach of Scotland’s cities and have a great range of accommodation nearby. The ski centres have great facilities and offer value-for-money for their green, blue, red and black runs. Scotland is ideal for skiing holidays, whether you want a weekend getaway, midweek break or a longer stay. The ski centres are well-known for being friendly places which provide a great service for all those who want to experience a thrilling ski and snowboard holiday within the UK. In and around the resorts there are , as well as cafes, restaurants, shops and to enjoy during your break. Each centre has its own unique feel – is the largest ski centre in the UK with no less than 36 runs. 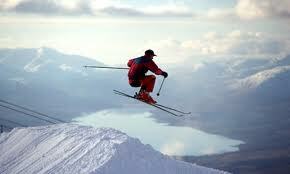 , Scotland’s first ski resort, is a popular centre with 19 runs to choose from. The near Fort William features the only mountain gondola of its kind in Britain and neighbours the country’s tallest mountain, Ben Nevis. is a favourite with skiers and snowboarders alike and has Scotland’s only funicular railway. In the eastern Cairngorms is the , the country’s most compact ski resort which enjoys the most consistent snow of all the resorts. For those looking to hone their skills, refresh their memory or learn from scratch on snow, you may wish to consider in Braehead. This indoor centre guarentees real fresh snow throughout the year and is the ideal place to test out your ‘ski feet’ before heading to the mountains. For your skiing holiday you might want to be based in one of Scotland’s key outdoor resorts like or , or in the wider area. From self catering lodges to hotels and B&Bs, you’ll find that the nearby caters for a variety of tastes and group sizes. The Scottish snowsports season typically runs between December and April, although it varies from resort to resort. Before you go be sure to check the , read our and remember that even when there’s no snowfall you can go skiing in Scotland thanks to the country’s ! Browse the listings below for ski schools, lessons and hire in Scotland.